The Cuisinart MCP19-18N multiclad pro stainless steel saucepan is perfect for preparing hollandaise sauce, steaming savory wild rice or simmering a hearty soup. The saucepan features Heat Surround™ Technology which allows even heat distribution across the bottom and side walls of the cookware. 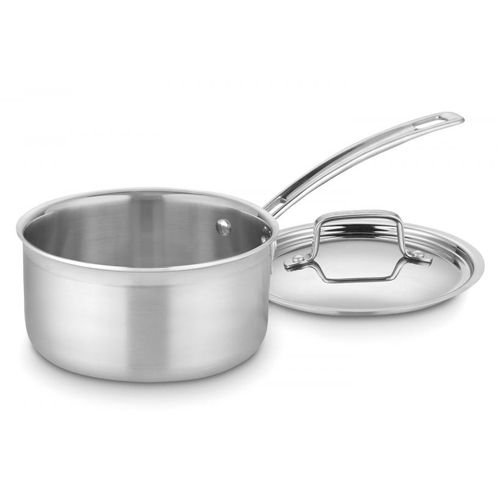 The Multiclad Pro Trple Ply 2Qt Saucepan W Cover Stnlss has many exciting features for users of all types. See the Multiclad Pro Trple Ply 2Qt Saucepan W Cover Stnlss gallery images above for more product views. The Multiclad Pro Trple Ply 2Qt Saucepan W Cover Stnlss is sold as a Brand New Unopened Item.